The Old Growth Forest Trail is, without a doubt, the most popular foot trail in Hartwick Pines. The 1.25-mile loop draws more than a quarter million people a year who use it to access the heart of the parks 49-acre tract of virgin timber, the largest continuous stand of old growth white pines in the Lower Peninsula. The Old Growth Forest Trail is, without a doubt, the most popular foot trail in Hartwick Pines. The 1.25-mile loop draws more than a quarter million people a year who use it to access the heart of the park’s 49-acre tract of virgin timber, the largest continuous stand of old growth white pines in the Lower Peninsula. 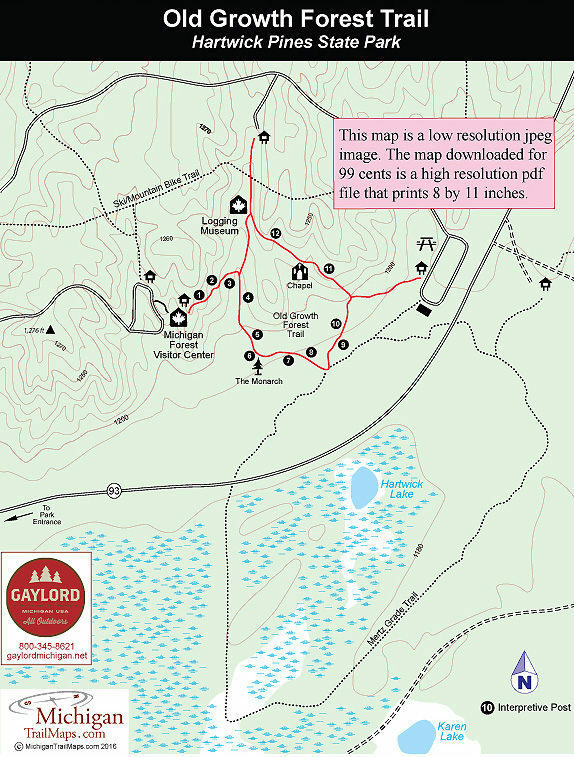 The trail features 12 numbered posts that correspond to an interpretive brochure available at the visitors center or can be downloaded from this web site and are laid out in a counter clockwise direction. Post No. 6 marks the Monarch, the most famous tree in the park. Before the tree died in 1996, the Monarch stood at 155 feet tall with a circumference of 12 feet and was thought to be 325 years old. Surrounding it is still some very impressive timber as the tallest trees in the park will be viewed from post No. 5 to post No. 9. The trail also provides access to the park’s Logging Museum, a quarter mile walk from the visitor center and even less from a trailhead just north of it. The museum is a replica 19th century logging camp with a bunk house and mess hall set up to show how thousands of men lived, worked and dined (rather well by the way) in the forests during Michigan’s logging era. Outside there are Big wheels, jammers and other logging equipment and a working sawmill that is operated by volunteers on several weekends during the summer. Near post No. 11 is the Hartwick Pines Chapel. Perched on a small rise the log chapel, surrounded by towering pines, is a secluded spot where many visitors pause for a few minutes of peace and serenity. Occasionally even a wedding will be staged here, a ceremony in the heart of the forest. 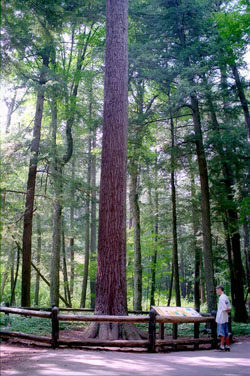 The park's stand of virgin pine is best enjoyed by first visiting the Michigan Forest Visitors Center (989-348-2537; www.michigan.gov/loggingmuseum). The history and growth of the Michigan forest is traced through a number of hands-on, computer generated exhibits, displays and photos of the men who cut the trees and the camps they-lived in. An especially popular exhibit is the talking "Living Tree." There is also an 105-seat auditorium that features a multi-image slide show on the history of logging. During the summer the center is open 10 a.m. to 6 p.m. Monday through Saturday and noon to 6 p.m. on Sunday. After Labor Day, the center switches to winter hours; 9 a.m. to 4 p.m. The park is open year round and an annual state park pass or a daily vehicle permit is required to enter. In the winter the Old Growth Forest Trail is a popular one for snowshoers and families looking for a short but unusual Nordic ski outing. The interpretive staff at the Michigan Forest Visitor Center hold a number of guided snowshoe treks along the trail on weekends throughout the winter. Old Growth Forest Trail is a paved, handicapped-accessible path that can be picked up from a number of entry points including the park’s picnic area. 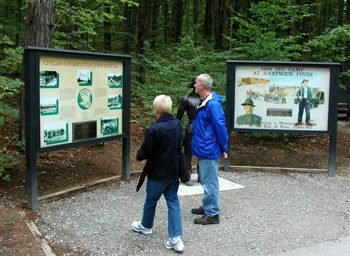 The vast majority of people, however, reach it after a visiting the Michigan Forest Visitor Center, an impressive interpretive area that was built in 1994. From the back of the center they can follow a short spur the leads to the main loop. For more information contact the Hartwick Pines State Park headquarters (989-348-7068).